I left my downtown office at about 6pm and drove east on the 10, took the 60 east, drove about 5 miles then got off at Whittier in East LA. 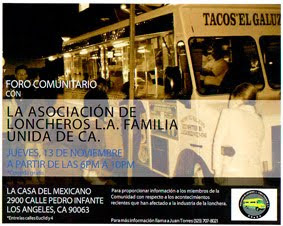 I figured I would just drive east on Whittier Blvd until I saw a taco truck. I was planning on driving as far east as Whittier would take me, but as luck would have it I only had to drive about another 2 miles, to the corner of S Record and Whittier, where I found a truck with a line of patrons and folding chairs. It was time to relax, pop open a bottle of jarritos, and eat some tacos. 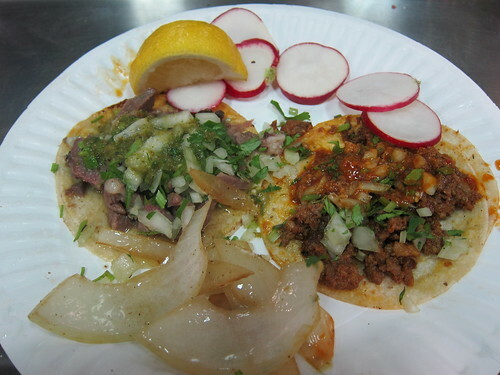 The tacos were 80 cents each and came topped with salsa roja or salsa verde(depending on the taco), grilled onions, and radishes to cleanse the palette. I ordered two al pastor, one chorizo, one asada, one lengua, and a bottle of orange jarritos. My total came to $5.50. I am probably in the minority here but I prefer when the tacos come already garnished with onions, cilantro, and salsa. There is just more symmetry with the meat, onions, and salsa than when I apply the condiments myself. Some trucks provide separate buckets of cilantro and onion which makes it even more difficult to find the right balance. 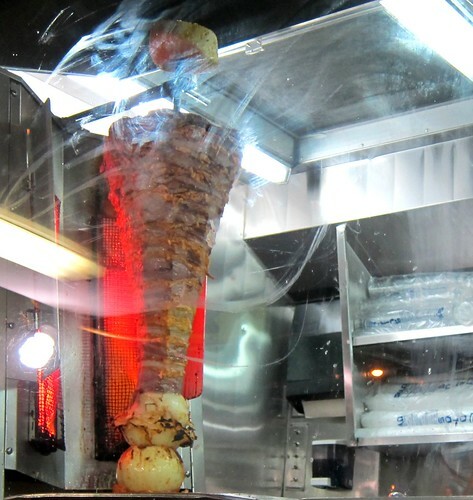 The al pastor was fully cooked on the spit and had a grayish tint not unlike the color of a gyro trompo. From my vantage point I couldn’t tell if the pork was cut directly on to the tortilla or given a quick crisping up on the grill, but its texture and the tenderness made me think it was the former. The salsa was moderately spiced so I ended up just rolling the serrano pepper into one of the al pastor tacos. At first I didn't feel a lot of eat but by the time I had moved on to the asada the greasy beefy flavor combined with the slow building spice form the serrano chile hit on all points. 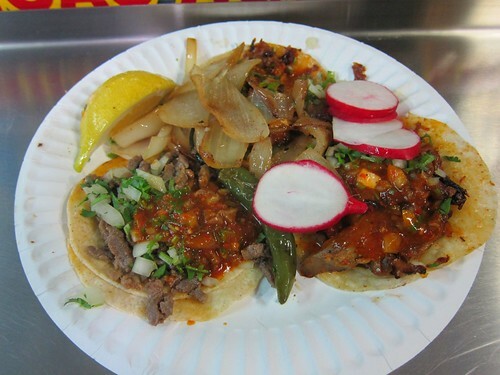 There were no gummy bits or fatty bits or funny bits with the asada that is the downfall of so many tacos across the city. 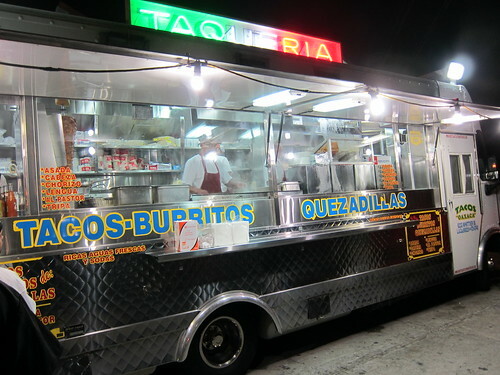 This was just a classic LA taco truck taco, the kind I remember eating when I first started eating off trucks. 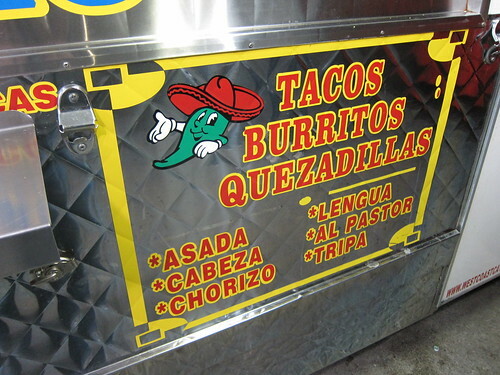 The chorizo was better that most chorizo I’ve ordered at taco stands, which can be too mushy and greasy. With this chorizo you could actually taste the individual bits of sausage. The lengua came topped with a mild salsa verde and after a good pinch of lemon I dug in. I’m glad I saved the lengua for last because of how strong the flavor was. Tongue is an acquired taste that I’ve yet to acquire, but I’m not giving up and will continue to order it. This was better than a lot of lengua I’ve ordered, I think. Ah! Damn my cursed unrefined palette that can’t tell good lengua from bad! After finishing my tacos I got back on to Whittier Blvd and drove west .I passed pop-up taco tables with al pastor spits, cemita trucks, and taquerias and contemplated pulling over. Reaching in my pocket I found a few one dollar bills, and some loose change; enough for a few tacos surely, but not enough to tip the taquero. Another time, I thought, and I turned on to Lorena St and got back on the 60.
where is their new address?. We're looking for it. Great price and better taste.